It’s that time of year again—February is National Children’s Dental Health Month (NCDHM), during which the American Dental Association (ADA), its members, and affiliates work to generate increased awareness of the critical nature of oral health across all segments of the population. As part of what has become a valuable annual initiative, many participating dentists also plan to incorporate Give Kids A Smile program events to further the goal of expanding and underscoring the importance of proper dental care practices everywhere. 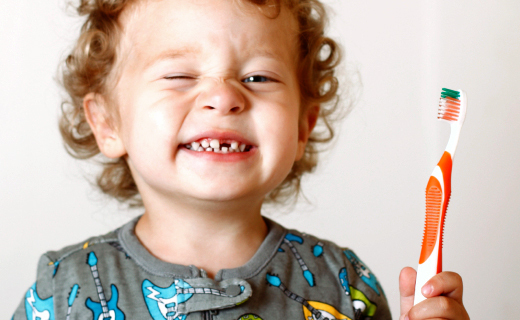 Since its inception, National Children’s Dental Health Month has resulted in widespread distribution of free resources and useful materials intended to promote the development of sound oral hygiene habits starting with the very young. Emphasizing the key role routine dental visits play in a lifetime of strong teeth and healthy gums, the ADA has used this program to help educate, inspire and support patients nationwide. In addition to the legions of dentists participating in this initiative, NCDHM also seeks to involve teachers and caregivers in the task of informing children of the need to keep their teeth and gums as healthy as possible. To that end, the ADA offers classroom lesson ideas; coloring pages, activity ideas, videos, and other materials that can introduce kids to proper dental care habits and practices. With its overriding mission of helping provide dental treatment and services to historically underserved youth populations, the ADA’s Give Kids A Smile program is a natural fit for inclusion within NCDHM. The program encompasses events that can occur at any time of the year, and in which family dentistry experts and other oral health practitioners provide examinations, treatment and dental education to children in locations across the country. Roughly 450,000 youngsters benefit from these events each year, with over 44,000 volunteers standing ready to help. Hosting a Give Kids A Smile event during NCDHM represents a natural convergence of objectives and will undoubtedly advance the cause of better dental health for all. To learn about our family dentistry practice in Atlanta, call today at or make an appointment. Dental One Associates offers affordable family dentistry and gentle, compassionate dental care in Atlanta. With 8 affiliated practices throughout Georgia, our offices are conveniently located with extended hours to meet your needs. At , we provide most dental services, from basic preventative care and general dentistry to specialized procedures and complete dental reconstruction. We accept most dental insurance plans and offer affordable financial solutions for any budget. Patient satisfaction is our top priority and we strive to provide the exceptional, affordable dental care and personal touch that lead to lasting relationships. A smiling patient is our greatest reward and we look forward to keeping those smiles healthy, beautiful, and bright. Discover an affordable dentist who truly cares at .